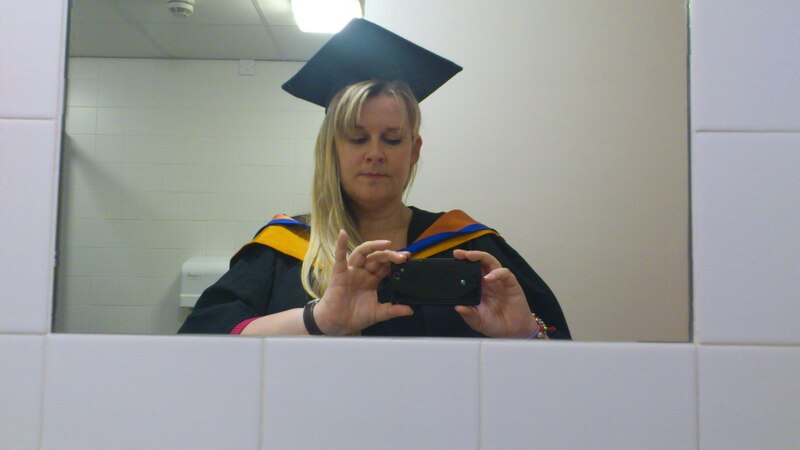 IT’S a funny old week for the staff of a university when graduation comes around. For the students, finishing years as students and about to step tentatively out of the world of lectures and daytime TV, it’s very exciting. This is when they finally get to wear the funny hats and show their parents/family where the money went. For the staff it comes a few weeks after the students have actually left. They’ve probably been marking piles and piles of papers solidly for four weeks and quite possibly cursing the students whose work will, or perhaps won’t, have earned them the piece of paper declaring them a graduate. Three years is a long time to be seeing someone almost every week. And naturally most lecturers develop relationships (not THAT sort) with their charges. You see the first years arrive, nervous and eager, who then proceed to doss their way rather too casually towards year two. This is the serious year, when it starts to dawn on them university work is nothing like A Levels, and they need to get their finger out to get better grades which will reflect in their final degree grade. Then if they make it to the third year, there are far fewer lectures and kicks-up-the-backside. They must start to actually use what they are meant to have learned to prove their academic worth. For the last three years I’ve been teaching BA (Hons) Journalism students and have joined my academic colleagues on stage at graduation to see my final year students collecting their gongs. There’s quite a lot of pomp and circumstance involved, with lectures having to don gowns and silly hats and parade onto the stage to sit and clap as hundreds of students collect their awards. We all wear the ‘colours’ of the university which gave us our degrees or the level of our academic magnificence (mine is a very boring, bottom-rung-of-the-ladder affair), while some of the PHD doctors and higher ‘Profs’ have some very elaborate garb. I envy those who have a squishy hat rather than a mortar board like me. They are a devil to keep on and can leave a delightful indentation on your forehead for the rest of the day. This year’s summer event was at the Derngate theatre, rather than in a marquee at Park Campus. As we waited in the wings for our fanfare to signal our entrance, we were given the instruction by an usher “may I remind you ladies, to keep your knees together while on stage. This ceremony is being live streamed on the Internet and we’d like to look dignified.” Apparently another group of academics were also told not to pick their noses on stage. There’s a lot of clapping; really a LOT. Every student has their name read out and a few weeks before the ceremony we lecturers have to fill out forms giving the phonetic spelling of the names of students with hard to pronounce monikers. It’s a wise move. The students prefer their big moment if it sounds like you at least know their name. Perhaps because I’m a newish lecturer, or maybe because since having my own children I’ve become a teary old wuss who wells-up at the slightest hint of sentimentality, I always get a fizzy nose and a lump in my throat when my students come up for their moment of adulation. Even, or perhaps especially, the ones who have driven me mad with laziness, inane questioning and unfulfilled promise over three years. The ones who at times I thought wouldn’t actually make it to the end. (Not so much the ones who by some bizarre twist of mathematics have managed to scrape a degree with very little attendance, effort or submitted assignments. But I clap them too). And by the way, while it’s pretty hard to fail a degree, it’s also pretty hard to get a decent grade. We had a first-class award on our course this year, thanks to the hard-working Miss Farida Zeynalova, BA (Hons), and lots of ‘two-ones’. Then there are ‘two-twos’ (nicknamed, the ‘Dessy’, as in, Desmond ‘Tutu’), and a ‘third’. You can even fail quite a lot and still chose to pick up a ‘non-hons’, or an ordinary degree, with the honours. Those who fail completely have a last chance to re-sit and potentially graduate next year. 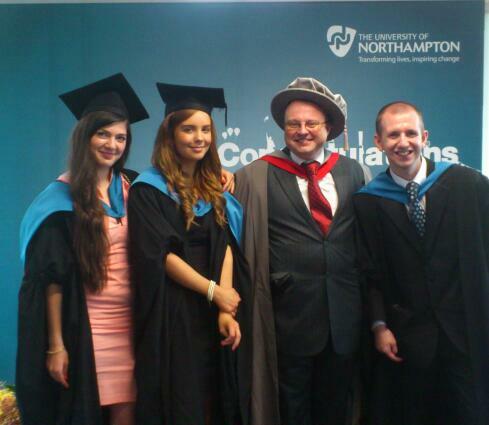 Some of the class of 2012, with Dr Jon Mackley (floppy hat); Farida (who achieved First Class Honours), Tamika and Simon. Afterwards there’s usually a glass of fizz and a chance to Meet the Parents (this is where you see cocky students become models of civility). It’s a form of closure as we wave off our charges and hope to goodness they will get a job or at least a sense of achievement and purpose from the university experience. It may surprise you to know we must be doing something right as despite the fees, the numbers are going up. Three years ago there were only five graduates on my course, last year around 18 and this year around 30, with only three having to resit exams or final projects to graduate in February. Next year’s Northampton journalism graduates are likely to number over 40, assuming they knuckle down and keep taking the metaphorical kicks to the derriere. And yes, despite the rumours of the media being a dying beast, there’s plenty of jobs out there for the ones who want them. The new graduates can get quite emotional as they leave, despite often doing nothing but moan about all the assignments and essays they’ve been forced to do. It’s a mixture of sadness at leaving friends and familiarity, and fear of the unknown. What comes next? My advice is usually to live a little, for a little while. The conventional new graduate will be in their early 20s, and while already with some debt, without the responsibility of a mortgage or kids. It might be their last chance for a while to see the world, or pursue a dream. But they must also remember they will only be the new-blood; the keen and fresh faces in their field, for a short while, until next year’s graduation ceremonies. Meanwhile, as I guess all teachers do, we wave off the leavers and get ready for the next batch of undergraduates, with their quirks and excuses, promises and potential.